The institute is based in village chadlai, tehsil Jhalrapatan, District Jhalawar which is lively & vibrant city, situated in Northern India at a distance of around 330 km south of Jaipur, capital city of Rajasthan & also 85 km from kota,known to be city of education of western india.Jhalawar is a city of vibrant colors; lively folk music and dance performance mark the celebrations of every religious occasion & every change of season. The jhalrapatan Bus stand is approximately 5 km away from the College & 15 km from jhalawar. Frequent city transport & private transport services are available for the institute from every point of the city. Campus: The institute is based in village chadlai, tehsil Jhalrapatan, District Jhalawar which is lively & vibrant city, situated in Northern India at a distance of around 330 km south of Jaipur, capital city of Rajasthan & also 85 km from kota,known to be city of education of western india.Jhalawar is a city of vibrant colors; lively folk music and dance performance mark the celebrations of every religious occasion & every change of season. The jhalrapatan Bus stand is approximately 5 km away from the College & 15 km from jhalawar. Frequent city transport & private transport services are available for the institute from every point of the city. Central library:The GECJ Library System consists of a Central Library which support the teaching, research and extension programmes of the Institute. All students, faculty members and employees of the Institute are entitled to make use of the Library facilities on taking library membership. The Library has a huge collection of books on engineering, science,humanities & as well as various journals,magazines & newspapers are also subscribed .It was initially setup in 2007 & the Central Library moved to its new building in 2009. The Library uses Libsys software package which is an integrated multi-user library management system that supports all in-house operations of the Library. The Libsys consists of modules on acquisition, cataloguing, circulation, serials, article indexing and OPAC. Retrospective conversion of bibliographic records is under process & will be available for access through the Libsys OPAC. The database of books available in the Library is being updated on day to day basis with details of recently acquired books. Records of all the Library patrons have also been created in the Libsys package. The editing and updating activities are in progress. The boys hostel has initial capacity for 300 students. The students taking admission in 1st year are encouraged to reside in hostel so that they are safe from ragging. Each student is provided with an almirah, cot, table & chair as well as English & Hindi newspapers. There is T.V. & sports(both indoor & outdoor games) for their entertainment. There is inhouse zym for those who want to keep themselves fit & healthy and 24 hrs Telephone & Internet facility. They are given three times meals per day & special diet on weekends. There is 24 hrs facility for security guard. 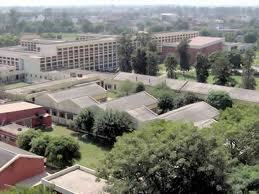 The girls hostel has capacity for 125 students. Each student is provided with an almirah, cot, table & chair as well as English & Hindi newspapers.The students are taken care by providing daily three meals, T.V. for their entertainment and inhouse zym to keep them healthy. Sweet dish and special diet are provided on satardays & sundays. The hostel timings are from 7:00 AM to 7:30 PM. The students are also provided with 24 hrs. telephone & Internet facility. There is a movement register for the inmates which is strictly followed. The hostel is guarded by 24 hrs security guard.